It is incredibly common for us to lay out a problem we are dealing with with an opening line that sounds like this: “I’m just feeling really insecure about….” and insert issue here. The problem with this for Christian women is that we actually have eternal security. In this episode we discuss which cues we are taking from the world that have normalized the idea that constant insecurity is just a happenstance of our lives before God. Let’s think through these things and be encouraged to lay our burdens down. 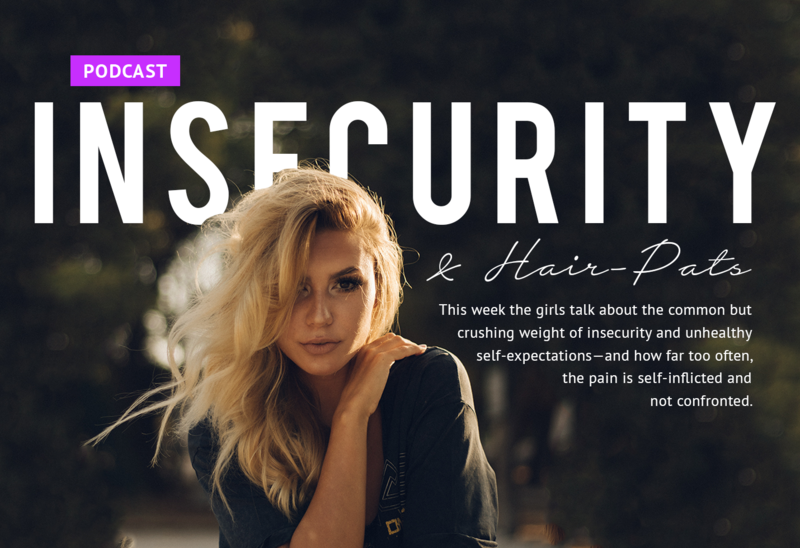 8:30 Summer gives her best shot at defining insecurity. 11:05 Joy brings her definition of insecurity to the table. 16:03 Insecurity is such an accepted way to be now that the horrible hair-patting response has also become normal. 18:00 Why Scriptural expectations are a better answer than sinful self-expectations. 28:30 Insecurity is often just the manifestation of the moment you realize you aren’t God. 33:30 The good news: we do not have to burden ourselves with guilt. 41:13 Relationships are easily damaged by those who are often insecure. 46:00 Is anyone really intimidated by how great you are? I have an unrelated question. What denomination do y’all go to? Just want to say since we have always lived in daylight savings time. Turn the clock ahead the day before. Cause then the kids can sleep in on Saturday and then Sunday is no issue, already adjusted. Girls..Keep.It.Up!!! Loving these last few episodes (love them all, but I always like the hard hitting episodes). As Voddie Baucham would say “if you can’t say Amen you oughta say ouch.” Praise the Lord, I can say Amen! This episode is so spot on and is a message that the modern Christian woman needs to hear (at least where I live in a leftist coast region). I used to live in a paralyzing insecurity. I learned that it was because exactly what you two have said; I didn’t trust God’s sovereignty, and I wanted myself to be the item of worship by both myself and others. On a different note, it is such a blessing to listen to you two grow in Christ. I’ve listened since the beginning and was astounded that you two were already much more mature that I was at your age. But it has blessed my heart so much to listen to you grow in maturity as you’ve grown in your marriages and motherhood (or soon to be motherhood). May God continue to bless you as you serve to bring glory to Him. I listened to two podcasts back to back today on insecurity. Insecurity and Hair Pats (Sheologians) and Instructive Synonyms for People-Pleasing, Insecurity, or Fear of Man (RickThomas.net). Insecurity … is a synonym or characteristic to what we call fear of man biblically (Proverbs 29:25). • Insecurity Defined: Placing your faith, hope, trust, confidence, or belief in something or someone that can be taken away. • Security Defined: Placing your faith, hope, trust, confidence, or belief in something or someone that cannot be taken away. 2) The written Word, which is the Bible. Christ and His Word are eternal, and they can never be taken away. If you have placed your faith in Christ, based on His Word, you will be experiencing security. If your faith is not secure and not settled in Christ and His Word, you will experience insecurity. I listened to Rick Thomas’ podcast last night and Sheologians this morning too! Both excellent podcasts on this subject.